The exhibition: This is Kyosai! Think of Japanese art, and chances are the images that come to your mind will be ukiyo-e, or woodblock prints. Parallel to this, and sharing many of its subjects, sits the country's traditional style of painting. Dubbed nihonga in the 19th century, this genre is less well-known but equally compelling. This is Kyosai!, at Tokyo's Bunkamura, collects the work of Kyosai Kawanabe, one of the most satirical of nihonga artists. 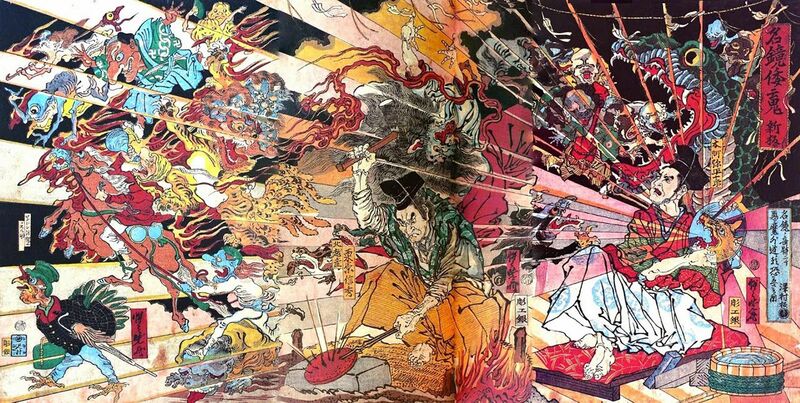 The spirits, monsters and colourful backgrounds familiar from ukiyo-e prints are here matched by Kyosai's scurrilous take on the Meiji era's advances and affectations. Olivier Assayas first collaborated with Kristen Stewart for 2014’s Clouds of Sils Maria, where she played an assistant to an insecure movie star. For Personal Shopper, a film he described in an interview at Cannes as a sort of companion piece to Clouds, Stewart features in an ostensibly similar role. But unlike its elegant predecessor Clouds, Assayas’s latest is horror sprinkled with fashion industry satire. The DJ behind the increasingly popular трип (“trip”), a label releasing psychedelic techno records, Nina Kraviz will perform in Brooklyn this Saturday for an extended set. She will be accompanied by Arthur Kimskii of Brookly’s Post Break, and Bunker-founder Bryan Kasenic. It's been almost a year since it was first announced, but Kismet, in LA's Los Feliz neighbourhood, is finally here. Founded by New York emigres Sara Kramer and Sarah Hymanson, it follows the pair's falafel joint Madcapra at Grand Central Market in focusing on the flavours of the Middle East. Sharing plate and vegetable-heavy, it combines traditional recipes with the ingredients of modern LA. Highlights include a frittata with chard, barberries and white beans, and a whole rabbit for two.